The garden is a central part of living at Lothlorien. On a basic level, it’s the main focus of the working day: everyone does what they can; and those people who are able put in two to four hours, five days a week. That work is productive: for at least four months of the year we’re self-sufficient in vegetables. Lots more are stored for eating the rest of the year – sacks of spuds, a sandbox of carrots, freezer-bags of blackcurrants and beans and peas. 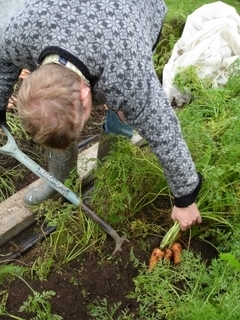 Even in midwinter there’s usually something – leek, cabbage, parsnip – being harvested. We are ‘organic’ in as much as we use no chemical biocides and no artificial fertilizers. While we make as much compost as we can from our own resources, we also bring in animal manures from outside; these are not always to full organic standards, but using them allows us to grow more produce of much higher quality than the shop-bought food that would otherwise take its place. So we’re as ‘organic’ as we practically can be. The principle is to ‘grow the soil to grow the crop’, and, alongside a rich and bio-diverse soil ecosystem, that results in healthy plants vigorous enough to shrug off most garden diseases. We use physical barriers to deter slug and rabbit – but if a few get past to eat their fill, there’s usually enough left for us as well. The growing area under vegetables runs to about 1500 square metres. The community decides what crops they want, and the eight-course rotation is a compromise between that and what our soil and climate will support. We benefit enormously from two 10-metre polytunnels which allow us a regular tomato crop, extend the growing season (those early strawberries!) and provide a drier and warmer workplace when the weather is less kind. Our lean-to glasshouse, now once again being renovated, is home to two vines as well as providing luxurious peaches and nectarines with, in early Spring, the most beautiful blossoms. The orchard of 17 apples, struggling with canker, yields somewhat fitfully: we’re near the climate/soil limit of what they’ll tolerate. There are also a half-dozen plum trees, gooseberries, raspberries and enormously prolific blackcurrant bushes. On some of the wetter parts of the plot we grow several varieties of willow, which make for attractive living fences as well as providing raw material for winter basket-making sessions. 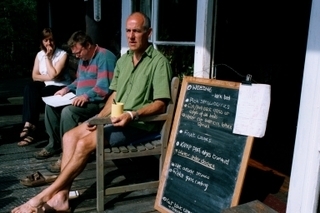 And in 1999 Lothlorien teamed up with South-West Community Woodlands, a local voluntary group, to plant four acres of native hardwoods on selected parts of our ground outwith the garden itself. We help in the management of these, keeping weeds down and replanting gaps as necessary. Seeing these new woodlands grow and enrich the landscape is deeply satisfying. Mostly around the house, but also amongst the vegetables, we grow a range of annual and perennial flowers: a small but very important part of our gardening. My role as gardener is to help people make the best use for themselves of the garden. For some it will be a place constructively to burn off pent-up energies; others may find a sense of purpose in the meticulousness of ‘pricking out’ seedlings or hand-pollinating the peach blossom. I try to make sure there’s something for everybody. Without pressure, there’s always more to learn, more to experience – there is for me. Often the simple act of getting our hands into the earth, knowing we’re working toward a tangible, tasteable result, can take us out of the repetitious patterns of thought we so easily talk ourselves into. I aim to ensure there’s a range of jobs available, to suit the range of people; and where needed I can provide the know-how to carry out those jobs. I also look after work safety matters, aiming for people to feel safe though not nannied. I hope to keep the garden an attractive place to work and to be in; and at the end of the day I hope to ensure that folk feel their work is recognised and appreciated. 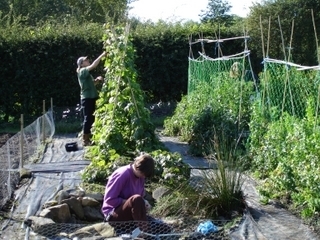 Most importantly, the structures around the garden – the work-hours, the organic methods, the crop rotation and the rest – are there principally to help it function, a means to an end. It’s a place where you can weed carrots and talk to those around you, or watch the robin risk getting closer while you mulch the flower-bed, or lose yourself in the blue of the sky or the hiss of rain on the lily pond in a quiet moment alone; a place to find some recovery.